In today’s Academic Minute, Dr. Peter Levine of Tufts University explores the social importance of active citizenship. 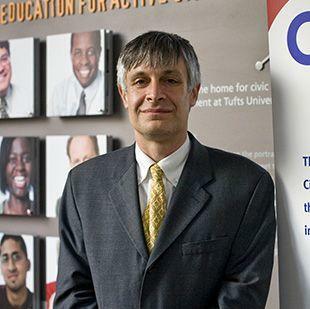 Peter Levine is the Lincoln Filene Professor of Citizenship and Public Affairs in Tufts University's Jonathan Tisch College of Citizenship and Public Service and Director of CIRCLE, The Center for Information and Research on Civic Learning and Engagement. He is the author of five other scholarly books on philosophy and politics, and a sixth, We are the Ones We have been Waiting for: The Promise of Civic Renewal in America, will be published by Oxford University Press in the fall of 2013. He holds a Ph.D. from Oxford University. Scholars are investigating what happens when citizens come together to solve problems in their communities. They are finding that citizens’ work is powerful and effective. In fact, neither the government nor the private sector can solve our most serious problems unless citizens are actively engaged. Participating in civic affairs teaches skills that are useful in the job market. “Soft skills” like building consensus and solving problems in groups, are increasingly valuable in the 21st century workplace, and you can learn them by participating as a citizen. Civic engagement also encourages people to trust one another so that they are more likely to undertake business partnerships. A thriving civil society strengthens citizens’ affection and loyalty to their communities so that they may choose to spend and invest locally. A strong set of independent organizations can hold governments accountable and improve their performance, cutting waste and corruption. What does all this mean for us as citizens? We have three jobs to do. One task is deliberation: bringing people from different perspectives and walks of life together to share and invent ideas, to learn from one another, to make ourselves accountable to each other. The second task is collaboration, or working together. We should bring our experience of making things into our discussions and take ideas and values from deliberation back into their work. The third task involves relationships. Civic relationships are not friendships, or financial partnerships, or romantic relationships—they fill a different need. But they are not devoid of emotion either; they are marked by loyalty, trust, and hope. Civic relationships are scarce but renewable sources of energy and power. A combination of deliberation, collaboration, and civic relationships is the core of citizenship. If we had more of this kind of civic engagement, we could address our nation’s most serious problems. In today’s Academic Minute, Dr. Anders Hakansson of the University at Buffalo reveals how a substance found in breast milk could turn the tide on drug-resistant superbugs. Anders Hakansson is an assistant professor in the Department of Microbiology and Immunology at the University at Buffalo. His laboratory investigates the pathogenesis of the gram-positive pathogen Streptococcus pneumoniae (pneumococcus), one of the leading causes of morbidity and mortality in children and the elderly worldwide. In today’s Academic Minute, Dr. Glynnis Hood of the University of Alberta explains the ecological importance of the beaver. Glynnis Hood is an associate professor of environmental science at the University of Alberta where her research interests include freshwater ecology, wildlife ecology and management, and parks and protected areas. Her current research focuses on wetland ecology as it relates to wildlife habitat and how the presence of beavers affects pond morphometry, biodiversity, and water quality and quantity. She earned her Ph.D. at the University of Alberta.